The following is part of a three-post progressive blog about the Center for Medicare Medicaid Services (CMS) choosing not to pay for the new advance care planning codes in this year's Medicare Physician Fee Schedule. However, now is the time tell CMS why you support reimbursement for advance care planning services in their call for comments. 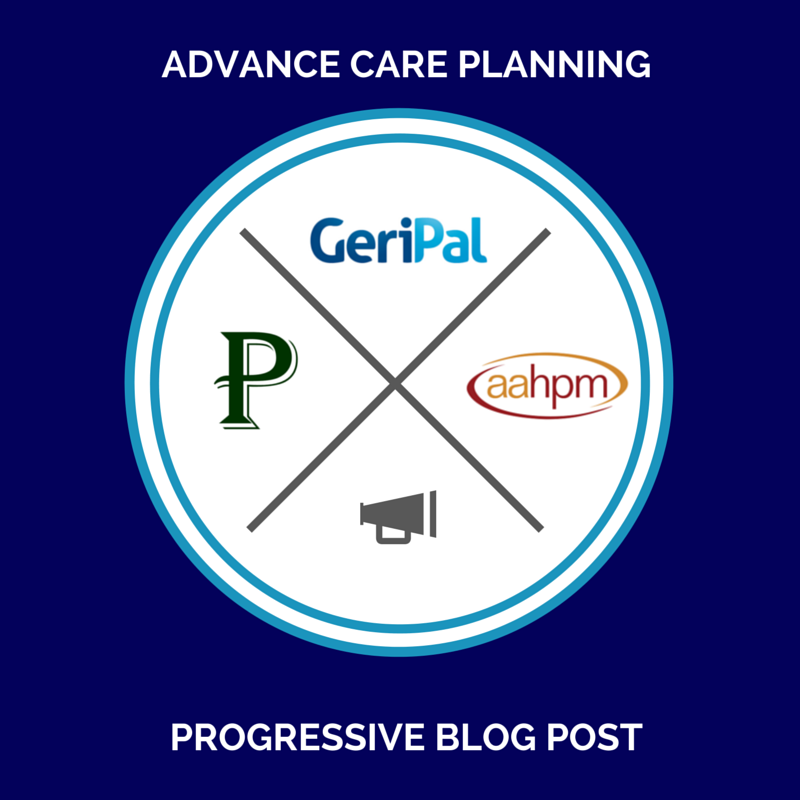 Please see also Phil Rodgers post on CMS considering reimbursement for Advance Care planning at Pallimed, and Gregg VandeKieft’s update on the state of ACP advocacy at the AAHPM blog. What will it take for advance care planning to become routine for patients with serious illness? It is time for US policy makers to put away the negative connotations of the "Death Panel" days and have a mature discussion about serious illness. No matter what your political persuasion, it is time for us to act to improve the quality of care given to all patients by promoting health advance care planning. With excellent communication and advance care planning, we can empower patients and families to ask for and receive the care that best fits their values and clinical situations. It is time for advance care planning to be a standard of care. Completion rates nation-wide should be as good as LaCrosse, Wisconsin. Excellent, on-going advance care planning that is adapted to the patient's values and needs over time should be an expectation of quality doctor-patient communication. But, we have work to do. At a recent large national meeting of primary care physicians, an audience poll found that most physicians acknowledged the importance of advance directive. However, most report they do not routinely address advance care planning. A key factor was time. Unspoken in that audience poll is the statement that time is money. For practitioners in most health systems in the US who are still in a fee-for-service model, the economic pressures are intensifying and advance care planning is not adequately reimbursed. But we can change that! The 2015 Medicare Physician Fee Schedule (MPFS) for the first time includes Advance Care Planning (ACP) services and there are now two CPT codes for these ACP services: 99497 and 99498. CMS has acknowledged both codes, but did not authorize Medicare to pay for them in 2015 (see Phil Rogers' Pallimed Post for more details on what the MPFS is and what these CPT codes are). While it is unfortunate that CMS did not agree to start reimbursing the ACP codes for 2015, they did provide a call for comments until December 30. So, stop reading this post and go to the CMS website (here) to tell them why you support reimbursement for ACP services. Be specific, be yourself, and write about what you know. It’s OK to reference the literature about ACP services and palliative care, the IOM report, the importance of tracking the frequency ACP is performed, the needs of an older and sicker society etc., but it’s more powerful to speak from personal experience. Tell patient stories that illuminate a connection between high quality advance care planning and better care for your patients. Every HPM professional I know has dozens if not hundreds such stories. Now is the time to tell them. Very good. Deep thinking and nicely presented. Thank you for letting us know about this opportunity to weigh in on the side of sensible advance care planning policies for Medicare reimbursement. I'm a certified nursing assistant working with elderly clients in their homes, so I see how important it is for individuals and their families who are facing serious illness or dealing with frail health to have good conversations with their medical providers about options for treatment and supportive care. I submitted a comment today. Just remember, palliative care folks, you are my heroes. What people seem to constantly confuse is there is a "Death Panel" of 15 people in the ACA that are appointed by the President. This panel has nothing to do with CPT codes for Advanced Care Planning. It would be a stroke of genius if someone would approach Sara Palen and have her spearhead this drive to pay for advanced care planning. The media has conflated these two issues that are totally different from each other.